Grease or line a loaf pan completely with foil (no need to grease foil). On wax paper, sift flour, baking powder & salt. Set aside. Place egg whites in a medium bowl, yolks in a large bowl. With an electric hand mixer on high, beat egg whites until they form stiff peaks. Set aside. To the egg yolks add oil, sugar & vanilla. Beat on high speed for about a minute until thick. With beater on low speed, slowly add milk, then slowly add flour mixture. Using a spatula, gently fold egg whites into flour mixture. Place about 2/3 cup of the batter into the empty egg white bowl. Fold in cocoa powder and 2 Tbsp. sugar. Spoon alternating layers into the pan. For the swirl, run a dull knife through the batter 3 or 4 times, lengthwise. Bake for 45 minutes or until a toothpick inserted in the center comes out clean. Cool in the pan at least 10 minutes. Store tightly wrapped. Variations: Try adding the zest of one orange. You would do that just before adding the flour. 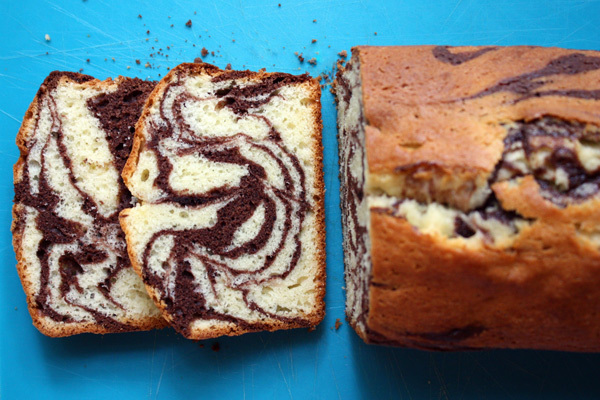 95 Comments on "Marble Loaf Cake"
This recipe looks delicious! 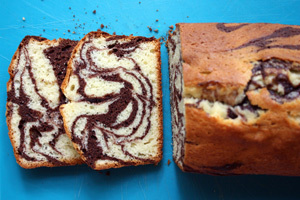 I have been looking for a marble cake recipe but I am wondering if I can replace the oil with melted or softened butter? Thanks! Yes, I tried the recipe with softened butter and the recipe worked just as well. Thanks Jenny. Tried this cake and it was absolutely delicious. Hi Jenny, how are you? I am a student. I wanted to make this since we are doing a cake stall for this market at school and I was wondering if you have made a video for this because I could not find a video of this on YouTube. If you haven’t got an video, could you make one so I could follow it and know what you mean in the recipe? And also, could I use normal milk instead of 1% milk? please answer me ASAP as the market is getting closer. I have only used 1% milk so I can’t say from experience but I think whole milk would work. My only concern is that it might make the batter too heavy so please let us know if you try it. I made the cake/loaf with normal milk not 1% milk and it worked perfectly well. Just on question, would you pour some of the white batter first then the chocolate on and the remaining of the white batter and use a knife and run it down length ways or what? I usually alternate white – brown – white – brown – white but you can do white – brown – white. The swirling is what’s important. Wanted to give a surprise to my son while he returns from school and made this cake now from your website. Even with just greasing and dusting the pan, the cake came out of the loaf tin without sticking. Looks yummy but the middle part has risen more than the sides and looks like a little mound. Why is that? Similar to a loaf of bread, this loaf is supposed to be mounded – you should be able to see that in the photo. I would say anything baked in loaf pan will be mounded, which is a good thing. Jenny where can I buy vanilla and cocoa powder? Walmart? I absolutely Loved this recipe, fairly easy but so delicious and nice 🙂 I love the swirlyness! Thanks Jenny!! I have only made it in a loaf pan so I can’t say for sure but I think it would double better in a tube pan. Look through the comments to see if anyone has done it. Thank you for your recipe, making the cake, I had a small problem about the salt، it gave my cake a strange taste, can I omit the salt ? Why is it important to add salt? Thank you for your recipe, making the cake, I had a small problem about the salt، it gave my cake a strange taste, can I omit the salt ? What is it important to add salt? You can omit the salt. I ran across this recipe by accident. My husband wanted something sweet but I was out of butter! Its the last Saturday before Christmas and I have been baking up a storm. I made this in a round 9×9 pan and instead of using cocoa I used the same amount of chocolate pudding instead. It was wonderful! Thank you so much for sharing! Please list all the exact ingredients you used, the size of the pan, what type of mixer, and how long did you preheat the oven? With some more information I should be able to help. Does the eggs have to cold or room temperature?? With baking it’s always better to have all your ingredients at room temperature. Eggs are easier to separate when they’re cold so you can do that in advance and let them warm up a little before starting. When something is not cooked in the middle it needs to bake longer. Baking is an exact science and even the smallest change can make a difference. If you try again, follow the recipe exactly and make sure you preheat your oven long enough. Use an oven thermometer if you can. If you’re new at baking, you could try a few easier things first like my lemon brownies or easy one-bowl cakes. Good luck! that is what I did let it bake longer and it turned out amazing! thank you! 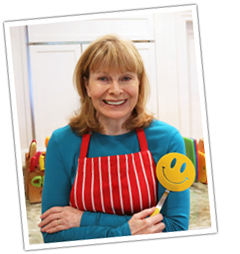 hi jenny, you wouldn’t have a recipe for banana bread that has had a jenny Jones make over would you by any chance. Hello dear Jennie. I made apple pie, its so great, thanks allot. I am from Ukraine, i never had so good pie. Its nice if you can make video on all your recipe. Thanks allot. Layla. Good morning. Okay if I add a few handfuls of chocolate chips? Hi, Jenny. I made this cake without the chips, and it was great. Here’s my mention on my food blog. Thanks. If it’s a round cake pan I don’t think it will work. It needs to be a loaf pan – about 8 inches by 4 inches in size. I don’t think this recipe will work in a round pan but I believe it would in a small bundt pan. Or you might be able to double the recipe and use a standard size bundt pan. I’m just guessing because I’ve made one very similar in a bundt pan. Let me know if you try it. Thankyou jenny. I just finished making this last night. I did end up using a Bundt pan and I didn’t have to double the recipe since my Bundt pan is quite small. I also covered it with frosting and sprinkles. My niece and nephew came over this morning and they tried a piece. They absolutely loved it and wanted another piece. P.S. Everyone was amazed at the marble pattern. I will be recommending your recipes to everyone I know. This cake was great! Loved it, mine was moist and delicious. I used unsweetened almond milk and canola oil. what will happen if i use only 2eggs?? Also, is it OK to use vanilla essence instead of extract? Baking is an exact science so when you eliminate an ingredient it often leads to failure. I’m sorry I can’t tell you what would happen because my recipe uses 3 eggs. Also, I have no experience with vanilla essence but I looked it up and it doesn’t seem to be commonly used, maybe because it seems to be “synthetic.” I have never seen it in my stores so I have never used it. Thus, I can’t tell you if it’s a good substitute. I wish I could be more help but I am not a trained chef, just a home cook posting the recipes I make at home. Thanks for sharing your recipe. I’ve made your old recipe before and it came out delicious but I want to try this one now. For the part that you add the cocoa mixture to, did you mean 1/3 or 2/3? It’s 2/3 of a cup. i am from india…i tried this caking using 1 egg and without chocolate.. it turns out unbelievable…. great sponge ..amazing taste..tat all without butter..wow!!!! loving it..
thanks a ton for sharing such wonderful recipe. what else can I use instead of the coco powder??? I don’t know of any good substitute for cocoa powder in a marble loaf, sorry. Hmmm was just sitting here wondering the same thing…I figure a pkg of carnation or other hot cocoa mix cud replace the cocoa and sugar. wondering if I can skip the milk? Baking is a specific science so if you skip the milk you would need to replace it with another liquid. I made this cake this afternoon. It came out great and was/is very moist, but my husband asked to try it next time with butter. For me it is okay this way. It is one of the best cakes I have ever tried. Thank you very much. I love this way with the separated egg whites. The cake rises more. Oh no…I was planning to make this cake again tomorrow( made it twice before) for “Family Day” get together…and I did not save your original recipe….the one before the beaten egg whites. Is there any way I can view that recipe again? that would be awesome…I’m not keen on this method….liked the first. I’m so sorry not everyone is satisfied with this recipe. I just want to say that this is not a pound cake. Pound cakes are moist but this is essentially a chiffon cake in a loaf. I really like it because it’s so light and does not seem dry to me when made with beaten egg whites. But I sincerely appreciate these comments as they are helpful to other cooks and especially to me. So if you’re looking for a marble pound cake, you will probably need a recipe that uses as fair amount of butter. But if you want to try my recipe, please read the comments below to see if it’s for you. Thank you again for your honest remarks. I have to agree with the other reviewer that this was a little dry. I will add a little more sugar next time too, but we all enjoyed it despite that. Well, despite the fact that I didn’t beat my egg whites properly, this still tasted delicious. It turned out a little dry, but the flavor was great. I just watched a youtube video on how to make stiff peaks so now I know that I didn’t beat them long enough…and then they separated…oops. Regardless, it will get eaten and I will try it again. My daughter liked it too, she just poured some milk on it to soften it up a bit. I would love to see a video, especially since I’m not a natural born cook. Thanks again for all you do! I am thinking about making this but I don’t have any oranges is it okay if I replace it with another citrus fruit. There is no other citrus that I think could replace the orange but you can just eliminate it. If you can wait a couple of days I am about to post a newer and better version of this recipe that is more moist and has a little more chocolate. Can i make this cake in a bundt pan ? I think a standard bundt pan would be too big but a 7 1/2-inch bundt pan would probably work. I was wondering if this time I can use chocolate chips instead of cocoa powder? Chocolate chips are not a good replacement for powdered cocoa in this recipe because you need the powdered cocoa to create the chocolate swirl. Is it okay to use vanilla extract instead of vanilla? In any recipe where I use “vanilla” it is vanilla extract (liquid). I made this cake and it came out JUST GREAT! I didn’t have milk so I used “Blue Diamond” Almond Breeze (Almond Coconut blend). Also, I did have to bake it an extra 10 minutes. And to make it even more special, I covered the top with chocolate ganache. Yummy! Thanks Jenny for this great recipe. update***this cake took about 56 minutes to bake. I’m eating a slice right now and its quite good. made a bit of simple chocolate icing to drizzle over top. makes it a bit better! cant wait to try this cake again tomorrow and see how much better it gets! Hi!! have this cake baking in my oven right now- its been baking for just over 50 mins and not quite done- having said that I don’t think I have baked too many loaf type cakes for only 40 minutes. They are usually 50 min- 70 min. Will post review after cake is baked, cooled and eaten!! Please let me know how it turned out. Someone thought it was a little dry so I’d appreciate your input. would it make a difference if i use vegetable oil in this recipe? I made it but the cake is a bit dry. I don’t know if i over cooked it or what but i set 40mins. Or i did something wrong??? It could be your oven temperature was higher than your setting so if you have an oven thermometer please test your temperature. But with baking, even the slightest change can make a difference. Please let me know if you used any different ingredient than I do and also what kind of flour and oil did you use? I make this cake a lot and it is never dry so please let me know if you made even the smallest change and we can figure this out. It’s important that my recipes work for everyone and this is one of my favorite sweets. Your timing is perfect. I decided to make my marble loaf tonight to make sure I didn’t give a wrong instruction and it came out as always, moist and delicious. And it does get even more moist the second day. How about this? You eat it the first day and make him wait until day two! 🙂 I’m glad you like it. Hi! just want to ask, is there be an effect if I will not add orange zest to the ingredients. Thanks! The orange zest just adds a nice added flavor burst but you can leave it out. does it have to be the zest of an orange? I just finished the last orange I have and happen to have lemons on hand. Would the zest of a lemon work? Lemon and chocolate? I wouldn’t try it. WONDERFUL cake. Finished it in 2 days so didn’t need to worry about it going dry! My family is already begging for another one. A standard loaf pan measures 9 by 5 inches across the top but some are a little smaller. The one is use is about 8 1/2 by 4 1/2 inches measured across the top. The bottom of a loaf pan is always a little narrower than the top. Thank you for the recipe, so happy with the cake! Jennie can I make this in a larger quantity and cover with fondant? How long can it last cos I didn’t see any preservatives in the recipe? I don’t know how you would make a loaf cake into a larger quantity. As for covering it with fondant, I guess you could cover it with any kind of frosting if you like. To keep this loaf, I wrap it in foil and keep it on the counter until the second day. After that I keep it refrigerated. This way it will keep for 4-5 days. It will become drier day by day but still okay to eat. All home baking has no preservatives, only commercially prepared products would use them. Can you use a dry bowl in place of wax paper? Yes, a bowl is fine and it’s what most people would use. I just try to avoid bowls to wash. I made this cake and it came out great! Thank you for this wonderful recipe.